“In December 2011 our 3 man team will set out in our revolutionary Polar Vehicle with the aim of beating the Guinness World Record for the fastest overland journey to the South Pole which is currently 2 days, 21 hours and 21 minutes”. World records, revolutionary cars and the South Pole. There’s nothing in that gambit that doesn’t draw you in and want to learn more – so that’s exactly what I did. A three-man team of adventurers are heading to the South Pole in an attempt to beat the current world overland record of 2 days, 21 hours and 21 minutes. It’ll also mark the 100-year anniversary of the first conquest by the Norwegian team led by Roald Amundsen, who successfully completed the epic mission on December 14, 1911. Less than 300 people have followed in Amundsen’s footsteps, but Thomson Reuters is sending an elite team to add to the tally, whilst using social media and a hi-tech car to let anyone join-in virtually. The expedition will have a dedicated Twitter feed, Facebook page and YouTube Channel, and they’ll be checking-in with Foursquare too. Okay, watching from a computer screen won’t quite hold the same thrill as being there, but the car they’re using to complete the trip is worth a little bit of attention anyway. The car will have 6 onboard mini cams (VIO POV HD) that will capture 1920 x 1080 HD footage, both from inside and outside the car. The team will also be using a Sony NX70 to capture blogs and film pieces outside of the vehicle. In terms of getting online, the team will be using the OpenPort system from Iridium, which enables connection speeds of 150kbps anywhere in the world. They’ll use a solid-state laptop with compression software which will plug directly into the OpenPort router, which is linked to a satellite hub on the roof of the car. “The team will be carrying two solid state laptops for use on the expedition”, says Matt Waddleton, Production Manager at Thomson Reuters. “Solid-state laptops are key due to the temperatures and altitude the team will be working in”. Whilst 150kbps isn’t the fastest connection in the world, it’s worth remembering they will be in the middle of nowhere, and they plan to send back videos, pictures and blog posts every few hours whilst on Antarctica. “No-one has been able to send regular high-quality video feeds back from expeditions in the South Pole before”, says Waddleton. “We are hoping to create an immersive experience that enables viewers to join us on this once in a lifetime trip”. Fans of Top Gear may remember the team’s journey to the North Pole some years back, a trip that attracted some criticism for its environmental impact. The car for this South Pole expedition was designed by UK transport design company Ian Nisbett Design Ltd (IND), and it’s hoped the car will “help define a new era in faster and more flexible Polar travel”. 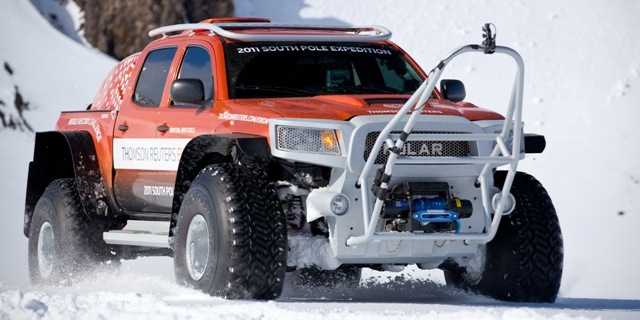 The Thomson Reuters Polar Vehicle has also been designed somewhat with the environment in mind, it’s a souped-up biofuel-powered former Toyota Tacoma, thus it should be more fuel efficient. It also comes equipped with solar panels. In late 2010, Thomson Reuters Eikon decided to offer a place on the expedition to a competition winner, so they invited the public to tell them in a maximum of 40 characters what they wanted to see change in the new financial era. After receiving 4,300 entries, they opted for Jason “JT” Thomas, a copywriter from Canada, to become the third and final member of the team. And Jason’s winning entry? “More Access. Less Excess”.